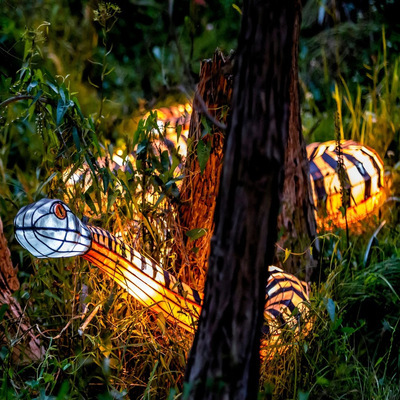 Enjoy warm evenings in the beautiful grounds of Boneo Maze on the Mornington Peninsula this summer thanks to the return of Lantasia. Boneo Maze presents Lantasia ‘Light Walk’ from 26 December 2017- 27 January 2018; an illuminating display of sculptural lanterns and light installations. The KidTown Melbourne crew went along to last year's Lantasia display, you can read about it Here. This was definitely one of our summer highlights. Lantasia begins as daylight starts to fade around 7pm and continues into the night. This is a chance for your family to explore the grounds of Boneo Maze in Fingal; a wonderful eco-tourism complex filled with gardens, boardwalks, mazes, a mini golf course and outdoor games. 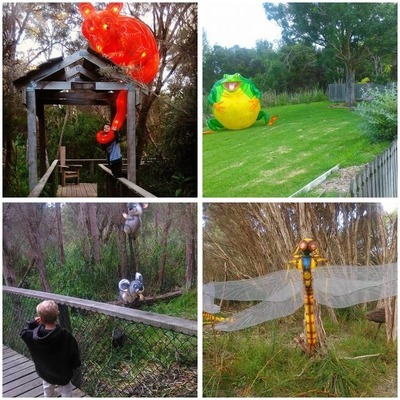 Lastasia sculptures are scattered throughout the grounds, adding a magical touch to your evening walk as your family spot native animal favourites in lantern form such as the heroic eagle Bunjil and the thirsty frog Tiddalik. 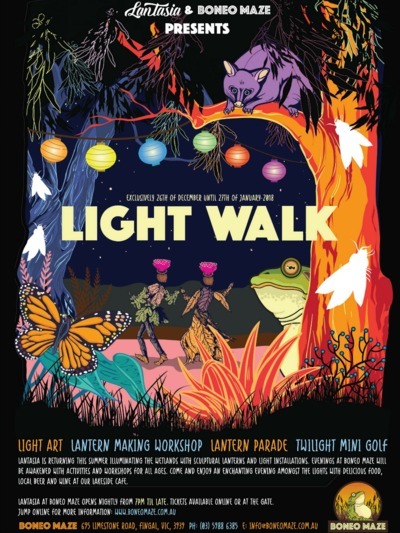 This year's theme is ‘Light Walk’ featuring some new lanterns and re-furbished lanterns from last year. This year the maze has been lit up so you can have an illuminated maze adventure. Enjoy lantern making workshops (every evening from 7 - 8pm), a round of twilight golf and enjoy delicious food plus local beer and wine in the Lakeside Cafe. The evening menu will include small dinner options with cheese boards, dips and bread plus 3 pizza options starting from $15. Dinner packages will also be available online soon. Boneo Maze is wheelchair and pram friendly and ample free parking is available. When: 26 December 2017 – 27 January 2018. From 7pm till late, daily. Cost: Adult $20 Child/Concession $18 Family $70 *Prices are the same as last year. Price includes entry into the park for LANTASIA, Twilight Mini Golf, Workshops and the Vintage Carousel. Savings Tip: If you have a Small Ideas membership you receive 2 admissions for the price of 1 for Lantasia 'Light Walk' at Boneo Maze.